New Hampton School's 197th Convocation ceremony marks the beginning of a series of memorable events, as the 9th grade class that arrived last week, and officially starts the academic year today, will be the school's bi-centennial class; these students will be the 200th class to graduate from New Hampton School. During the school year, faculty are focused on students. They dedicate countless hours to classroom instruction, curriculum development, residential life activities, coaching, and time spent building important relationships with their students. One of the reasons they are so successful at their jobs is because of their ability to role-model the New Hampton School mission; to cultivate lifelong learners who will serve as active global citizens. New Hampton School is thrilled to welcome Meredith Brown, History Department Chair, as the 2017-2018 Convocation speaker. Last year, the student body selected Ms. Brown to receive the O'Connor Excellence in Teaching Prize, awarded to a teacher who is caring, inspiring and represents the best of New Hampton School. 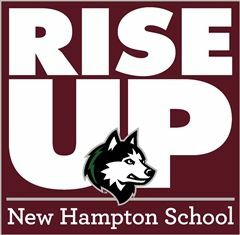 While the meaning might be nuanced for each member of the community, we are eager to see how the New Hampton School community will Rise Up together in the 2017-2018 academic year. 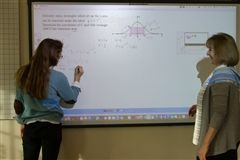 One of 400 schools from around the world, New Hampton has been awarded the Polar3D Classroom Package as part of the GE Additive Education Program. 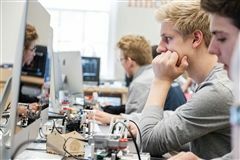 The Polar3D Classroom Package includes two different 3D printers plus materials, and a Tinkering with Turbine kit. 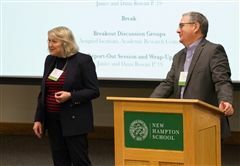 As part of the program, New Hampton School will have access to GE's STEAM educational modules, and live training webinars for faculty throughout the year. Please join us in welcoming Scott LeBrun and his family to Husky Nation. 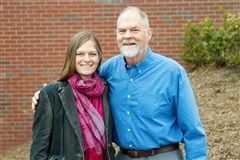 Scott joins us as the Director of Student Life for New Hampton School. 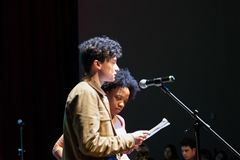 Summer Reading offers an opportunity for the whole school community to return to campus in the fall and unite around a collective experience, reflecting on themes, inspiration and insight gained from a shared reading over the summer months. New Hampton School kicked-off Reunion 2017 on Friday night with a pig-roast on the Memorial Dining Hall patio. 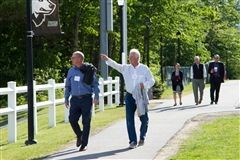 We were thrilled to welcome over 175 alumni and their families—ranging from the class of 1948 all the way to those that graduated just a mere ten days ago. 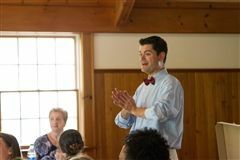 In his commencement address to New Hampton School's 196th graduating class, Roddy W. Ames '02 of Charlestown, MA spoke to the assumptions associated with "Generation Z." Rather than emphasize the criticisms of a generation entrenched in technological advances, and a world defined by electronic and online advances, Ames highlighted the strengths of this generation: "You are constantly on the move, you have energy, you are creative and forward thinking. You are socially aware, and you never back down from a challenge. Use the momentum you feel today to confidently begin your next challenge. Continue to embrace change, implement and master the newest and best technologies, embrace cultural difference, compete to your highest capabilities, and put your best foot forward every day." 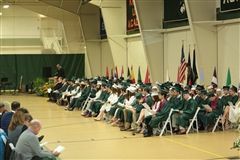 On the eve of graduation, New Hampton School celebrated the Class of 2017 with a Senior Awards Ceremony followed by an intimate Baccalaureate gathering for the Class of 2017 and their families. The evening commenced with Senior Awards, where exceptional students were recognized for making significant contributions to specific areas of the School. 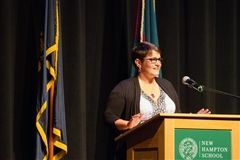 On Friday, May 19th, the community gathered to recognize underclass students who have made significant contributions to the School in academics, service, athletics, and arts. 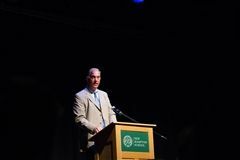 Following a thoughtful ceremony celebrating many accomplished students and a wonderful school year, Head of School Joe Williams closed with the following remarks. 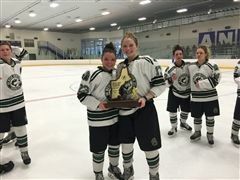 Two New Hampton School teams celebrated back to back Lakes Region Championship titles on Saturday; the Women's Varsity Softball team defeated the Tilton School Rams, and the Men's Varsity Lacrosse team closed a second undefeated season with a hard-fought battle against the Brewster Academy Bobcats. 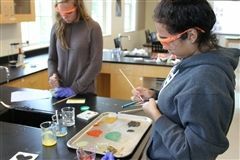 With the close of the 2016-2017 school year, New Hampton will graduate its largest International Baccalaureate Diploma class to date with 29 students completing requirements for the full-IB Diploma. 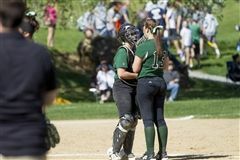 Husky Nation has enjoyed a rigorous and inspiring spring athletic season with full of impressive talent and teamwork. While varsity teams will compete in the Lakes Region Tournament this week, we celebrated a great season and recognized specific athletes for the contributions last night. Good luck to our varsity teams competing this week and congratulations to all on a fantastic season! The Art Department, with the help of many volunteers, organized an incredible campus-wide celebration of the arts. The range of creative activities stretched from building a brick patio to tie-dying t-shirts to drum circles to animation and everything in between. 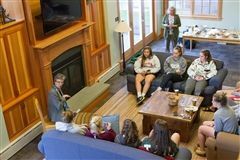 Tamar Piehler, Class of 1982 and NHS Trustee, graciously agreed to spend some of her time on campus in advance of the Board of Trustees meeting this week, speaking with female students about Women, Leadership, and the workplace. Tamar is the Chief of Staff for VP of Operations at Cisco Systems. She is also a member of the New Hampton School Board of Trustees. 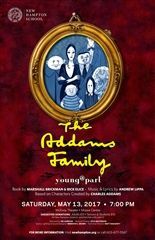 New Hampton School performs "The Addams Family Young@Part"
On Saturday, May 13 at 7 pm, the New Hampton School theatre program will be showing "The Addams Family Young@Part.” A book by Marshall Brickman and Rick Elice, with music and Lyrics by Andrew Lippa, based on characters created by Charles Addams. Every spring, New Hampton School takes a day to celebrate our diversity of heritage, culture, and perspective. 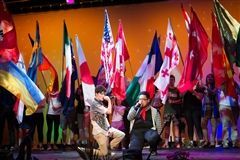 International Night is a highlight of the spring, full of energy, enthusiasm, bright colors and cuisine. But International Night is only the tip of the iceberg when we think globally about our school and our values. Husky Nation embraced Earth Day with a full week celebration and meaningful opportunities to learn about the earth and how we can take care of it. 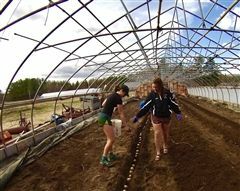 Led by Science Faculty and Sustainability Coordinator Bekka Joslin, each day of the week has had a different emphasis connected to the theme "Reducing your Carbon Footprint." 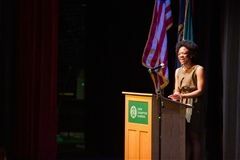 New Hampton School welcomed Vermont 2011 Poet Laureate, and Pulitzer Prize Finalist, Sydney Lea this week for visits with New Hampton School English classes, faculty, and the community. 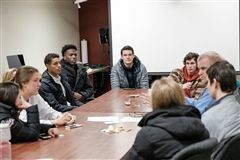 This unique oppportunity helped students connect their reading and course work with an in-person experience. A highlight of the week occurred when Mr. Lea joined us on Thursday to share his story and answer questions about his life as a writer and published author. Course Selection; What Should I Study Next Year? It's always nice to have choices. This Friday, April 7th, all underclassmen will meet with their advisors following school meeting to select classes for the 2017-2018 school year. 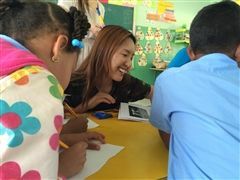 Our mission as a school is to cultivate global citizens, and one of the ways we fulfill our mission is to have the entire academic curriculum centered around providing a global perspective to our students. This is a special week for New Hampton School. Over the course of two days, more than 60 families will join us on campus to carefully consider returning to New Hampton for the 2017-2018 academic year. 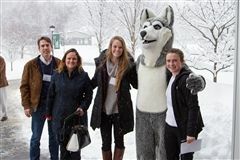 Saturday, we were thrilled that nearly all of the families scheduled to Revisit campus braved winter storm Theseus to join us for an energetic glimpse into all the things we love about New Hampton School. Congratulations to our Winter Student-Athletes! 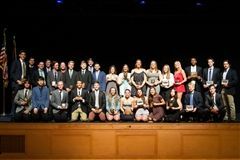 Last night we celebrated all of our winter teams and a fantastic season of athleticism, teamwork, camaraderie, shared championships and defeats. Congratulations to all of the student-athletes who participated in winter sports. The students below were recognized for their exceptional leadership and contributions this season. Much of our important work as educators would be lost if we didn't share and engage that work with the parents of our students. 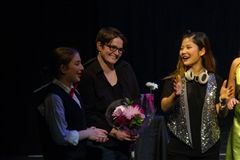 New Hampton School invites parent involvement on many different levels which enriches the great work that happens each day in our classrooms, in student houses, on the fields and on the stage. What does March Madness mean for NHS Huskies? Here on campus, we are busy following the legacy of New Hampton School Basketball, and cheering on all our alumni involved in March Madness. Many are players, some are coaches, and fellow alumni are out at the games cheering on their peers. This year, four alumni represented the school in the NCAA March Madness Tournament– with one continuing to the Final Four this weekend in Glendale, AZ! In addition, eight other Huskies have played in collegiate post-season tournaments. 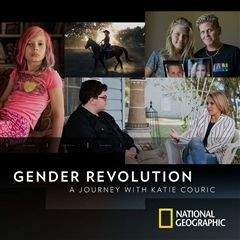 On April 11, New Hampton School will host a free screening of Gender Revolution: A Journey with Katie Couric. This two-hour National Geographic Channel special first aired on Monday, February 9th, and aims to explore the changing nature of gender in society. The screening will be hosted in McEvoy Theater at 6:30pm and is free and open to the public. The two weeks our community takes in March to relax and rejuvenate are so important both to reflect on the months that have passed and to prepare for the busy days of spring ahead. Students return from break full of anticipation for the home stretch ahead. Not only are we anxiously awaiting our green and flowered campus, idyllic classes on the lawn, and warmer days, but each spring in Husky Nation is marked by traditions that celebrate the diversity of our community, our graduating seniors, and the relationships we've built over the year. What does it Mean to Be a Husky? It's an exciting time of year for many secondary school students as they think about educational options for the upcoming school year. In an impressive display of athleticism, teamwork and talent, the Lady Huskies played their way to a Championship title winning 3 consecutive games to end the season. Project Week is Finally Here! On Monday, March 3, all students and faculty will begin 1 of 28 different projects. While some projects take place across the Atlantic and in faraway states, others are right here on campus. Each group is exploring an essential question that they came up with, and which was approved by the project week committee. Trip leaders and students worked together to design their projects around the exploration of their essential question. A series of activities, trips, meetings, and reflections throughout the week will hopefully lead each group to a better understanding of the question they've asked. The New Hampton School art department proudly recognized their Scholastic Art Award Recipients at Monday's School Meeting. The Scholastic Art Awards of New Hampshire is a statewide network of art educators, artists, and arts institutions who are members of the New Hampshire Art Educators' Association and strives to foster creative expression and artistic achievement in all students grade 7 -12. Students are returning to classes today after an action-packed weekend. 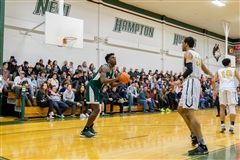 We were lucky to host more than 60 alumni over the course of the weekend, in addition to many local guests and current parents that joined us for the 31st New Hampton School Basketball Invitational Tournament. Twelve New Hampton School students have work on display at the Plymouth State Juried High School Art Exhibit from February 2-26. The Karl Drerup Art Gallery will host a reception and awards ceremony this Sunday, February 19 from 2-4pm, with an awards ceremony at 2:30. On Wednesday, February 15, 2016 Husky Nation will participate in a student-led, Relay for Life event in order to fundraise for the American Cancer Society. 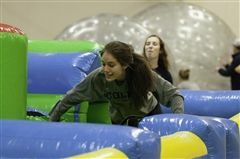 The event is part of this year's Service Learning curriculum, as a group of students were driven to fundraise in service of an outside cause. Director of Studies Matt Fisk reflects that he often gathers new ideas and perspective when thinking about teaching and learning in other contexts. Over the summer, Mr. Fisk was lucky enough to attend a New England Patriots football practice. He then shared this analogy with our faculty and staff. It seems especially fitting to revisit today, following last night's Super Bowl championship for the Patriots. Alex Myers returned to New Hampton School last night, after first visiting in late August. 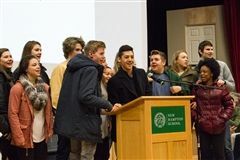 Following a workshop with faculty and staff at the start of the school year; he was invited back to lead the whole community in a conversation about gender and identity. 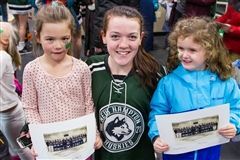 New Hampton School Lady Huskies young and old came together to celebrate National Girls and Women in Sports Day, in Husky Nation and with our neighboring communities. Two NHS equestrian students, JT and Mairead, recently traveled to Wellington, Florida to participate in the College Preparatory Invitational Horse Show, or CPI. As they explain on their website, CPI offers young equestrians the opportunity to explore the college equestrian experience through a comprehensive education, competition and scholarship / community service program. 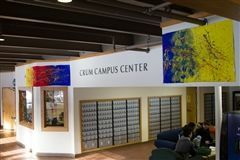 Visitors to campus this month will find a collection of engaging art displays throughout the Crum Student Center, across school grounds, and in other buildings. As part of their IB Visual Art Course, students in this class created art installations around campus that would engage viewers in reflecting on our community. Last week, Husky Nation shared in the national celebration honoring the work of Martin Luther King Jr.
We are excited to welcome students back to campus this week for a few more months of Winter in Husky Nation!